Officers at a San Francisco police station Friday thanked a homeless man who came to the aid of a colleague who was attacked when she tried to make an arrest. 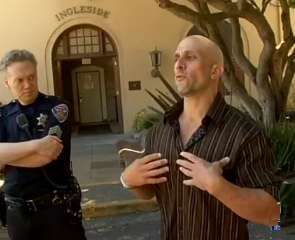 After four days of looking for Ryan Raso, San Francisco police finally found him. The 35-year-old was a wanted man; not as a suspect, but as a hero. It happened last Monday near a small crowd of people who stood by watching. Mr. Raso wrestled the attacker to the ground and later said his father, who was a former NYC detective, would have been proud of him. The officers from the Ingleside Station are now “looking out” for the man, helping him to find shelter.